Agriculture.com writer John Dietz has featured Happy Rock Holsteins Limited of Gladstone, Manitoba and how they converted to an all-robotic, computer assisted dairy barn in September 2013. Read an except below or the entire article here. Dairy producer Steve Smith, after 37 years of milking cows in the United Kingdom and Canada, has the barn he’s dreamt about. He and wife Nicola hope it is well suited for their children, Amy, Hannah, and Joe. The $3.4 million concrete barn has a 392-head capacity, but it’s without a milking parlor. Computers and infrared ID tags for each animal are at the heart of the system. Robots handle nearly all the chores. The need for staffing, Smith says, is down to about eight hours a day that includes record keeping, herd health, feeding, fresh bedding, and other management. 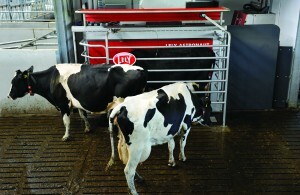 Lely introduced the Astronaut A4 robotic I-flow milking stall about the time Smith was committing to barn construction. Design capacity is approximately 180 visits a day for 60 cows. Smith ordered six A4 milking stalls at about $200,000 each. 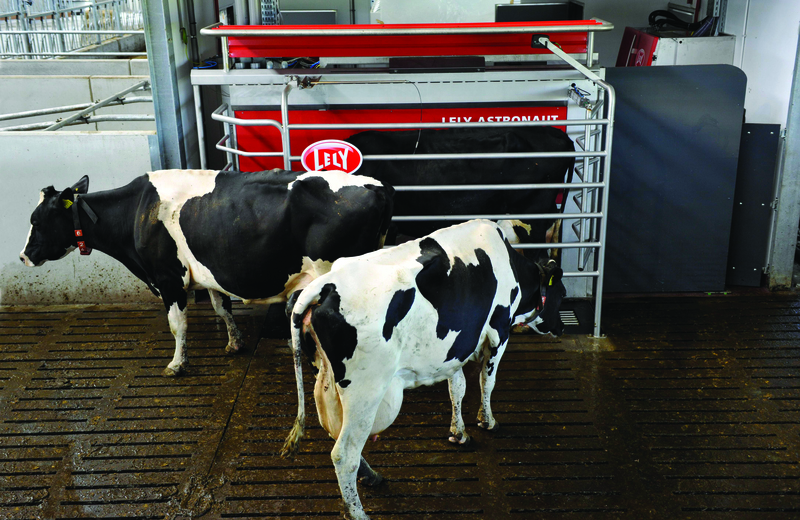 According to Lely, the Astronaut A4 achieves a new cow-comfort level. Cows approach the milking stall, walking beside a wall and into an open framework, which ends with their bowl of measured feed. The bowl is mounted on the exit gate. While a cow eats, the robot works below to prep and milk the cow. With milking completed and teat dip applied, the exit gate and feed bowl slide out of reach, into the wall. In response, the cow simply walks forward again to clear the milking stall and to make room for the next in line. Always, three or four cows are ready for their turn. “This box is built on the outside of the robot. Instead of walking into a completely enclosed stall, the cow walks straight in and straight out. There are no angles, no turning or corners, just a couple sensing bars,” says service technician Jim Voth, Penner Farm Services, Blumenort, Manitoba. Smith’s barn was taking shape in early 2013 when Lely introduced the Commodus cubicle for a hygienic radical new approach to cow comfort. His dairy is the first in Canada that is fully equipped with the Commodus bedding stall system. The Commodus separates cows with curved, tongue-like steel tubes rather than walls. Each tube is hinged to a central concrete wall that fully supports the tubular device horizontally at a level about 1 meter (yard) above the bedding area.